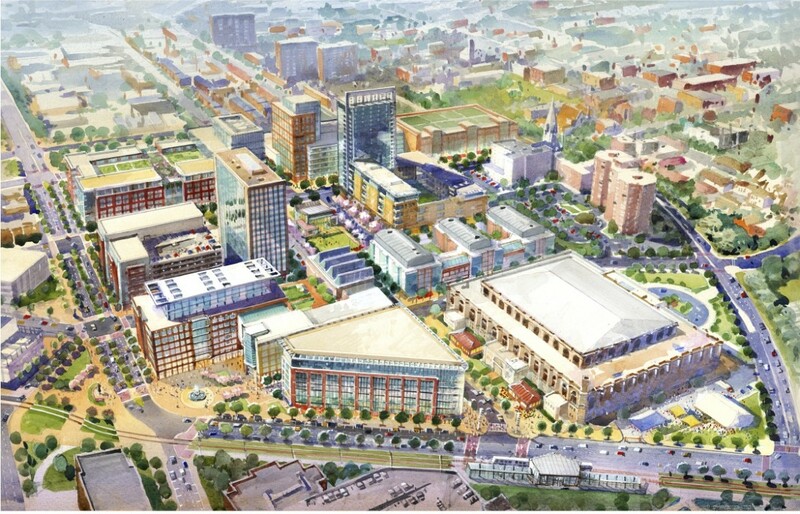 Above: View of State Center proposal with Martin Luther King Boulevard on the left and armory at bottom right. Readers responded to Barry Rascovar’s column on the State Center project, he details other options in this column he published Thursday in his PoliticalMaryland.com blog. Next week, lame-duck Gov. Martin O’Malley may decide to bring the matter of the $1.5 billion State Center project before a divided Board of Public Works. It would be a controversial move. Readers responded to my previous column on this topic with some interesting thoughts. Their conclusion: There are far better ways to redevelop this space and provide decent offices for state workers in Baltimore. “In my opinion the universities and hospitals are the glue that holds this City together once you get away from the Inner Harbor. “How about they move the government uses down to the [Central Business District] as [Peter]Angelos suggests and then make the State Center parcel available to the [University of Baltimore] and/or [the Maryland Institute, College of Art] so that they can expand their campuses, while incorporating into the project some retail and other amenities that would benefit neighboring communities? “It was an ill-conceived idea from the start. There is so much B [office] space in the Central Business District available suitable for state workers at much better rates/rents. Owen, a longtime development pro, believes the State Center site is ideal for a new city arena. A few days ago, Comptroller Peter Franchot chimed in as well. Not surprisingly, he’s against the amended plan, just as he opposed older versions of the State Center proposal. Then there’s the question of endangering Maryland’s triple-A bond rating. State legislators are concerned State Center subsidies might put Maryland over its capital bond cap. Even if that’s not the case, the costly lease agreement will put a crimp in the state’s operating expenses for decades to come. It’s also worth noting some of the points made in the Department of Legislative Services analysis of the revised State Center proposal. First, the plan now is based on the state taking an additional 115,000 square feet of office space — for a total of 515,000 square feet. That means yanking more state agencies out of the downtown business district, which already is hurting badly from high vacancy rates. Second, these sky-high leases — $35.85 a square foot, plus a 15 percent inflation factor every five years — “would not be subject to appropriations in the State budget.” It is the only such project that is exempt from legislative oversight and review. Third, the now-shrunken underground garage still would cost the state $28.3 million, leading to an annual debt service of $2.5 million for the state and an annual loss to the transportation trust fund of $2 million per year. Fifth, moving expenses alone will cost the state $2.4 million. Then the state will mothball the existing buildings. That adds another $5.8 million per year in expenses. Sixth, DLS questions whether a private charter school is best situated in a state-leased office building. That’s the latest plan from the developers. DLS also wonders if it is realistic for developers to anticipate a supermarket will open in the Firth Regiment Armory building, with its high walls and enormous heating and air-conditioning bills. “It is unclear if any of these changes make sense,” DLS concludes. Do nothing, which will require costly annual patch-ups to the 50-year-old structures. Sell the State Center buildings now in use and rent space elsewhere. Downtown office rents are cheap and there’s oodles of quality space available. Buy out the developer and re-bid the project — but this time limit the RFP to one new privately owned office building for state workers. DLS raises significant and substantive issues that cry out for careful scrutiny. Since the State Center plan was first unveiled to great fanfare in 2005, times have certainly changed. What is now under examination may not be economically feasible. There may be far better uses for the site. There are far less expensive ways to find better office space for state employees. Perhaps most telling, the state no longer has the financial strength to give such a generous subsidy to a private developer for a project that is, at best, marginally viable. There are plenty of reasons to take a “go-slow” approach on the State Center proposal. We could learn next week if O’Malley agrees.